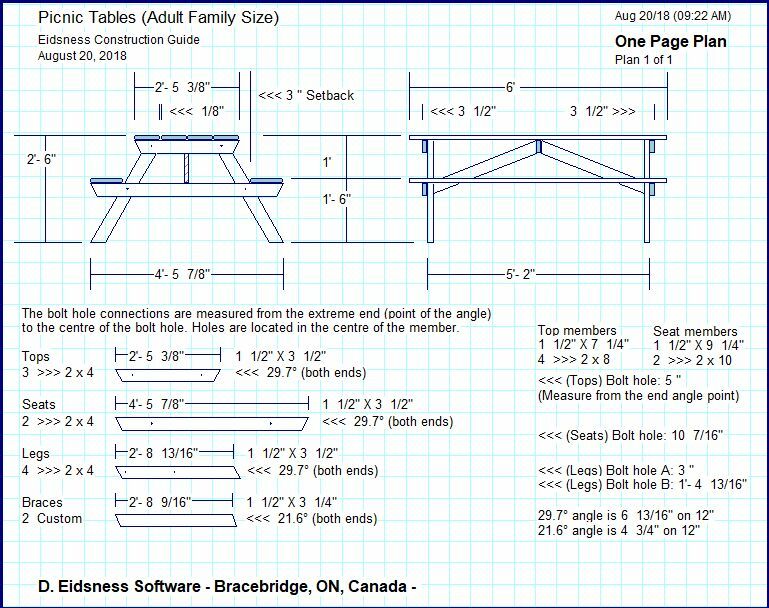 Here is an adult family picnic table plan using 2 x 4, 2 x 8 and 2 x 10 SPF lumber. Pressure treated lumber is recommended for the table legs to resist rot from soaking up ground moisture (scroll down to see photo below). Starting with the design panel the-software generates a 1 page plan, a 4 page plan as well as an 8 page booklet. 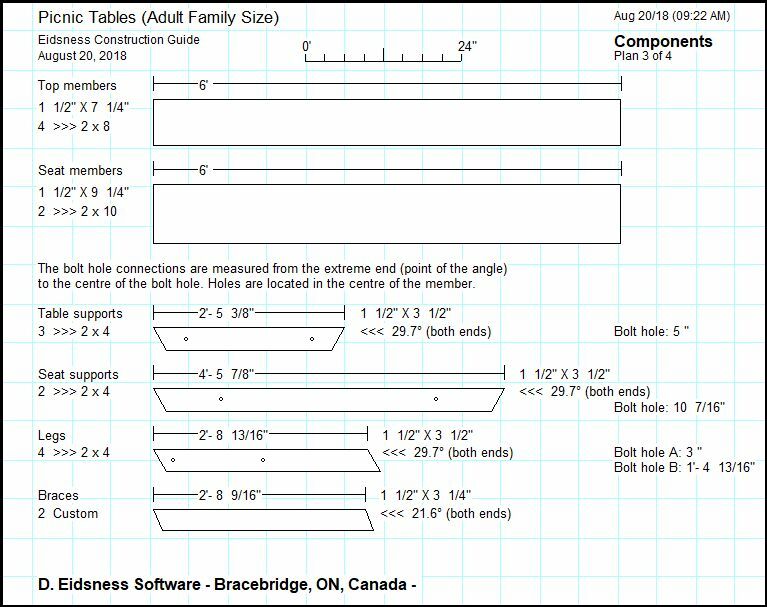 The 8 page booklet prints out on an 8.5 by 11 landscape orientation with two plans per page. The print out page with the two plans can be cut in half to produce individual pages. The first or cover page of the booklet includes advertising information pursuant to the registered user of the software. Advertising also appears on the footer of every page. The designer can enter a title that will also appear on every page. Plans can be saved for future reference or use. The number of plans or amount of detail is up to the designer. 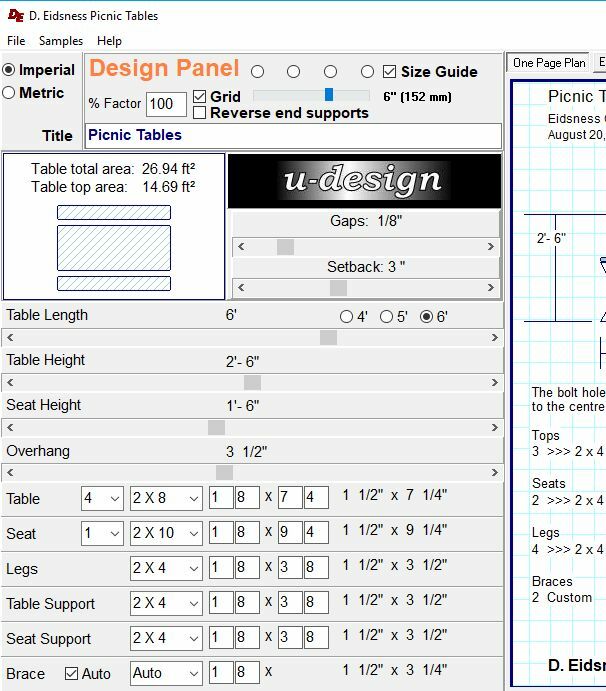 Simply input preferences in the design panel on the left and watch the table plan change on the right hand side. 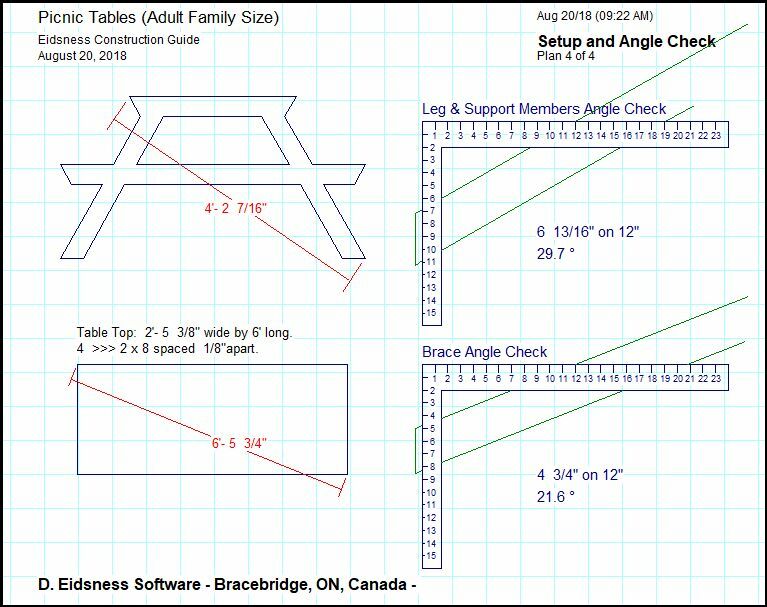 The program has a "Samples" drop down function that shows plans sized from toddlers to adults. Below is a One Page Plan for those who aren't looking for larger illustrations and extra detail. This is a closer look at the design panel. There is no learning curve or need to read and study pages of instructions. 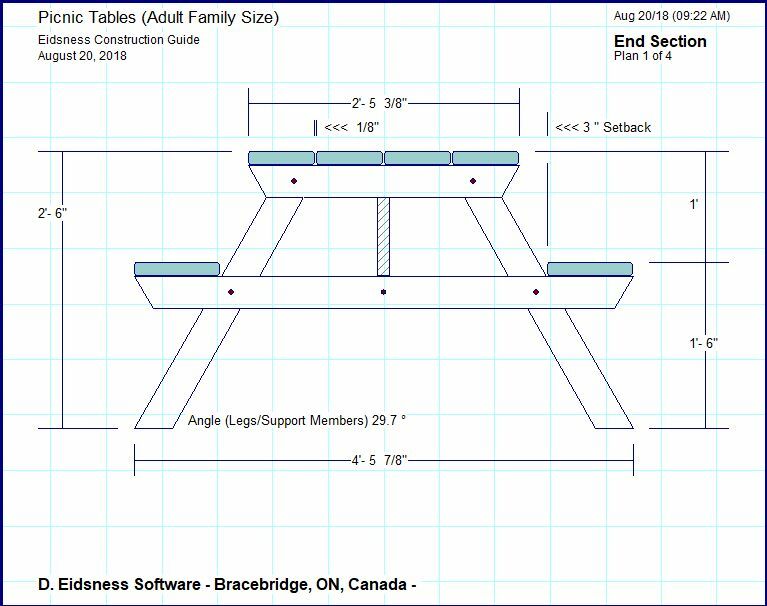 Anyone can design a table to their liking by simple entering or changing the data on the deign panel and watching the design change on the right hand side of the screen. Scroll bar controls eliminates the need to enter data. Simply drag the control or for fine tuning, click in front or behind the bar to move 1/16" increments per click. 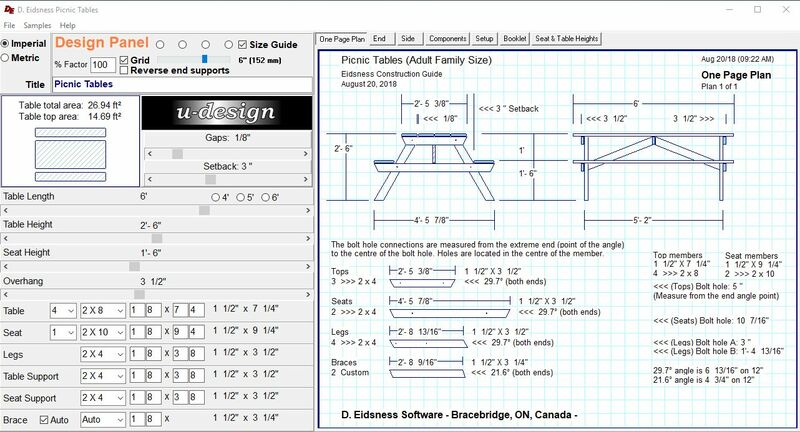 The lumber sizing uses standard thickness and widths which can be over written by inputting actual sizes in the edit boxes. 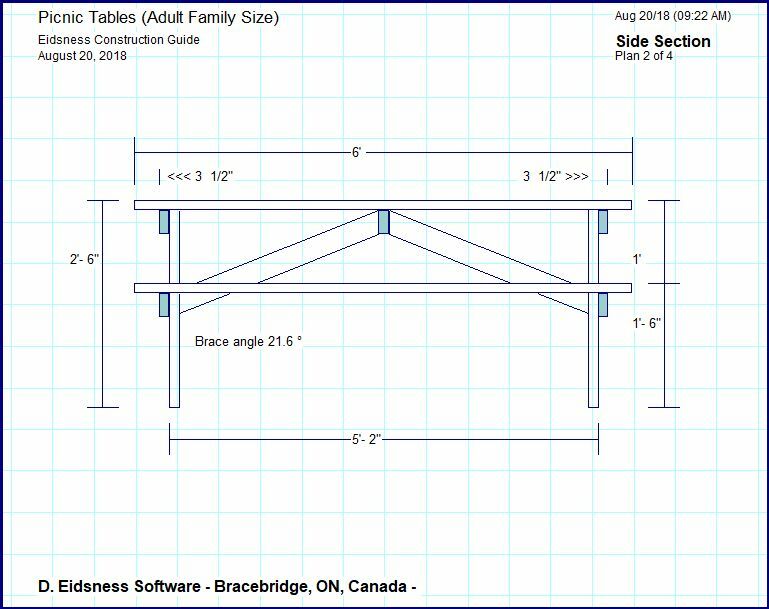 There is a tab for seat and table height guide that may help when designing a table for a specific age group. Actual measurements of individuals are the best way to go since heights can vary considerably between girls, boys and families in general.